When I was in first grade I distinctly remember loving my teacher. Mrs. Shiffner, my mom away from home. I can’t tell you a thing I learned, but I remember her, her face, her voice, and how she loved us so much. Even at six years old I knew she loved me...wait, I remember gerbils, love and gerbils...good year. Second, third, fourth, fifth...many more memories...being picked on, attempting to talk to girls, not fitting in, playing Pogs with the other kids who didn’t quite fit in, teachers who fought for me, teachers who fought with me...Mrs. Griffith, the first teacher to send me to the principal's office...I deserved it, yet to this day is one of my absolute favorite teachers. I remember my sixth grade teacher Mr. Benzo...why? Because he told us a story I have never forgotten: He said he had a sixth sense...How did he know? He once dreamed that he was driving his car, and as he was passing the cemetery on County Holmes Boulevard (yup, even remember the street name) all four tires blew at once, his car rolled, and he died. So the next day, when awake, he was driving to the store, and as he was about to pass the cemetery he remembered his dream. He quickly pulled over, inspected the tires, and each tire had a nail in it! --- As a sixth grader, MIND BLOWN - as an adult...really man? Really? - All good, love you Mr. B. Of course, the older I got, the more memories that stayed with me...and while I can remember a few projects in school, what I remember most are the moments teachers gave me a second chance. Moments of teachers taking their time to explain something I just didn’t understand. I remember girls I liked, subjects I didn’t, and my Spanish teacher who let me take quizes I missed during her lunch hour...why do I remember that? She would always leave to heat up her lunch, and her answer key was always on the overhead projector...yup, missed a lot of quiz days, and it’s no wonder I left my second year of Spanish without being able to even say a short phrase in Spanish. Kindergarten to twelfth grade...so many memories, many are good, and honestly...many are bad. Yet there is power in this, and as educators we need to remember something...we have the ability to create lasting memories. Take some time, reflect on your past...what do you remember? Do you remember the daily tasks or the relationships? The multiple-choice tests or the difficult moments that brought tears? Each day educators come to work with the power to create a memory. A memory that will last a lifetime...but here’s the question, what type of memory do you want to create? No matter how hard I try, I have as many negative memories as positive ones. As a teacher, you will be remembered in some way, the question is this...how do you want to be remembered? For most teachers, creating lasting memories is not something they signed up for. After all, how many teachers entered the profession with a passion for their subject, and a desire to help students become successful? Two great things…but whether they like it or not, memories will be made for their students. Many that have nothing to do with the subject they teach. Educators have a powerful job as each day matters...they change lives and work in a profession that is relational, emotional, and life-altering. 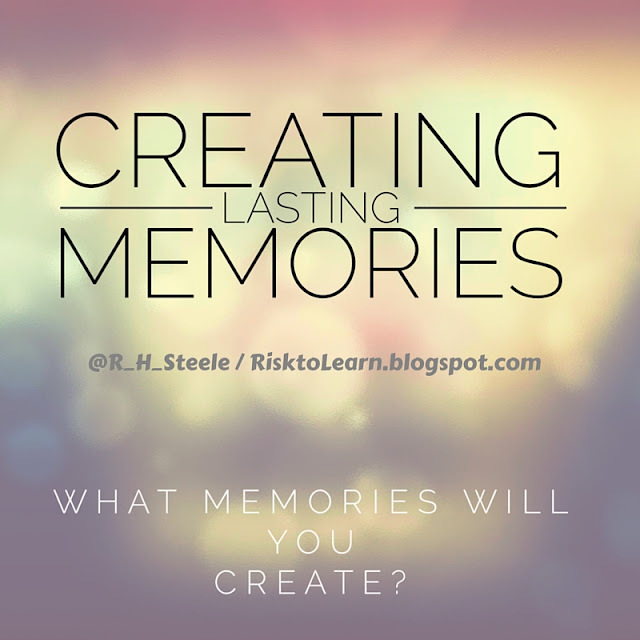 Each day offers a new set of memories to be created...so here is the question...here is the point...ask yourself: What memories do I want to create for my students? Each day you are creating lasting memories for someone. Be sure to make memories worth keeping. We are in the business of caring about students and meeting their needs whatever those needs may be, as much as we are able to do that. I enjoyed reading about your memories, good and bad. Luckily, I really don't have any bad memories caused by teachers when I was in elementary.